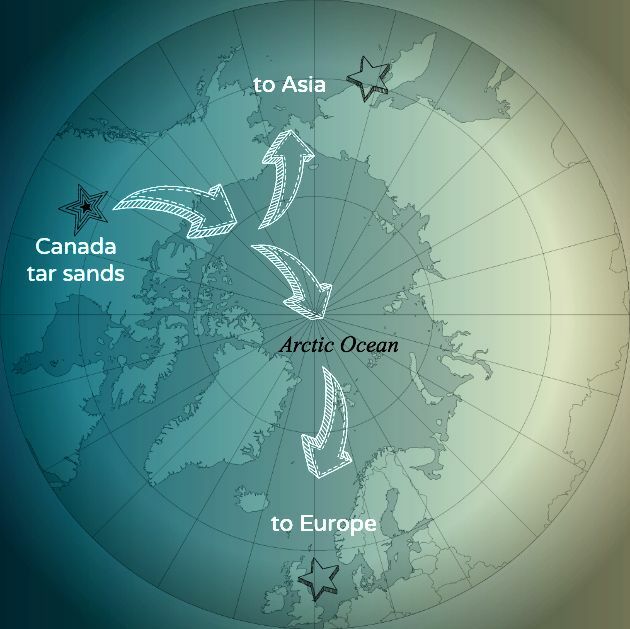 What Could Go Wrong Here Revisited | Passing Through . . . .
Canada’s possible Arctic Ocean routes to deliver tar sands oil to Europe and Asia, bypassing the troubled Keystone XL pipeline to the Gulf of Mexico. Map base by Tentotwoat Wikimedia Commons. Canada is considering bypassing the beleaguered Keystone XL pipeline—which would carry oil from tar sands deposits in Alberta to the US and the Gulf of Mexico—by shipping across the Arctic Ocean instead. The proposal is in its infancy, reports the Alaska Dispatch, but is developing as Keystone XL and other proposed pipelines to British Columbia and Quebec remain in limbo. Not to mention which does Canada really think they’ll escape the wrath of Greenpeace—plus a major redirect of anti-Keystone energies—on an Arctic Ocean oil shipping plan? Indeed…what could possibly go wrong?